Given that disorders of the smell and taste are rarely life threatening, they don't attract large medical attention. However, these disorders can be frustrating, because they can affect the people's ability to enjoy food, drinks and pleasant smells. Also, loss of these senses may interfere with a person's ability to observe potentially harmful chemicals and gases, which could have serious consequences. Smell and taste are closely linked. Taste buds on tongue recognize taste while nerves in nose recognize odor. Both senses transmit these information to the brain which combines the same data to identify and clarify aroma. Fibers of nasal nerve containing receptors for smell are bent on honeycombed plate - bone of the brain base that separates the area of the skull from the nasal cavity. While some flavors (salty, bitter, sweet and sour), can be recognized without sense of smell, complex flavors, such as strawberries require both senses to recognize them. 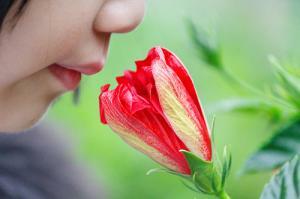 Loss or reduction of ability to smell is the most common disorder of smell and taste. Since the distinction of one from the other aroma is largely based on smell, people often first notice reduced sense of smell, if the food seems tasteless. The sense of smell can be lost by changes in the nose, in the nerves that lead from the nose to the brain or in the brain. For example, if the nasal passages are blocked due to colds, the sense of smell can be reduced simply because the smell is prevented to come to the receptors for smell. As the ability to smell affects taste, people who have a fever often aren't able to feel real food flavor. Receptors for smell can be damaged by influenza virus (flu). Some people for a few days or even weeks after an attack of influenza lose their smell or taste. Sometimes the loss of smell and taste lasts for months or even become permanent. Sense of smell may be damaged or destroyed by a serious infections of the nasal sinuses or radiation in the case of cancer treatment. However, the most common causes of permanent loss of smell are head injuries. Rarely, people are born without a sense of smell. Reduced or lost sense of taste is usually caused by conditions that affect the tongue such as dry mouth, heavy smoking (especially pipe smoking), radiation treatment of head and neck, adverse effects of drugs such as vincristine (cancer drug) or amitriptyline (medicine for depression). Taste disturbance is usually caused by the same factors that have resulted in loss of taste. Burns on the tongue may for some time destroy the taste buds. Besides that, Bell's paralysis (unilateral paralysis of the facial nerve) can numb sense of taste on one side of the tongue. Also, loss of sense of taste may be a symptom of depression. Depending on the cause of taste and smell disorders, a doctor may recommend a change or stop taking suspected drugs, maintaining wetness of mouth by sucking candy, stop smoking or just waiting a few weeks to see whether the problem will disappear. Also, it is believed that products containing zinc accelerate senses recovery, especially when taste and smell disturbance is consequence of influenza attack.